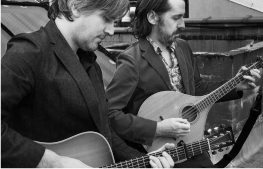 Jefferson Hamer and Eamon O’Leary present traditional and original folk songs with close harmonies and deft arrangements on bouzouki, guitar and mandolin. O’Leary played Irish music while growing up in Dublin, then relocated to immerse himself in New York City’s traditional music scene. Brooklyn-based guitarist/vocalist Hamer won a 2013 BBC Radio 2 Folk Award with Anais Mitchell for their adaptations of English and Scottish folk songs. In partnership with the Gaelic League of Detroit. Ticket holders may also enjoy a complimentary Irish dance workshop starting at 7 p.m.